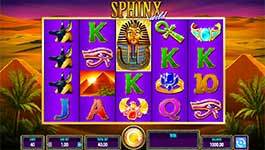 Review of: Expand your kingly wealth in Sphinx Wild slot by IGT! Head out to the deserts of Egypt where Pharaohs and ancient kings have stashed untold wealth, in the new 40-line Sphinx Wild slot machine by IGT! At the base of the pyramids, the mighty Sphinx stands guard to vast chambers filled with untold riches. Triggering the free spins round will earn you a choice at your free spins bonus with up to 60 free spins on offer. Watch for Tutankhamun's face which is the game's wild and can expand to turn adjacent symbols wild too! Head out to the deserts of Egypt where Pharaohs and ancient kings have stashed untold wealth, in the new 40-line Sphinx Wild slot machine by IGT! At the base of the pyramids, the mighty Sphinx stands guard to vast chambers filled with untold riches. Triggering the free spins round will earn you a choice at your free spins bonus with up to 60 free spins on offer. Watch for Tutankhamun’s face which is the game’s wild and can expand to turn adjacent symbols wild too! Surrounding Wilds – Expand your kingly wealth with the Surrounding Wild feature, where Tutankhamun’s mask turns itself and all adjacent symbols wild! Any wild symbol on the reels expands and turns all surrounding symbols wild, if that expansion results in a win. Free Spins – Make your way to the king’s chamber for the Free Spins Bonus and choose your preferred multiplier value and number of free spins! The Free Spins Bonus is retriggered when three or more Bonus scatter symbols appear anywhere on the reels. Re-triggering the Free Spins Bonus re-opens the picker after the spins-in-progress are complete. The bonus can be re-triggered multiple times, up to a maximum of 600 free spins per bonus. If the number of free spins awarded is greater than 540 and the trigger combination reappears, only the scatter win is paid and additional spins are not awarded.